Every home built by Design Specialty Builders is as individual as the clients that call it home. Our designs are inspired by the elements most important to you. From the type of flooring to the paint colors and everything in-between, your home will be a completely custom reflection of your style. We competitively bid every phase of your project and work with the best sub contractors to make certain their work is of the quality we expect. Our craftsmen and subcontractors take pride in their work and are trained to build according to the highest standards. Custom cabinetry, barn doors, bars, built-in shelving, benches, window seats, desks are all unique feature we can build for you. If you dream it, we can build it! At Design Specialty Builders we include everything that will make your house a home the day you move in. 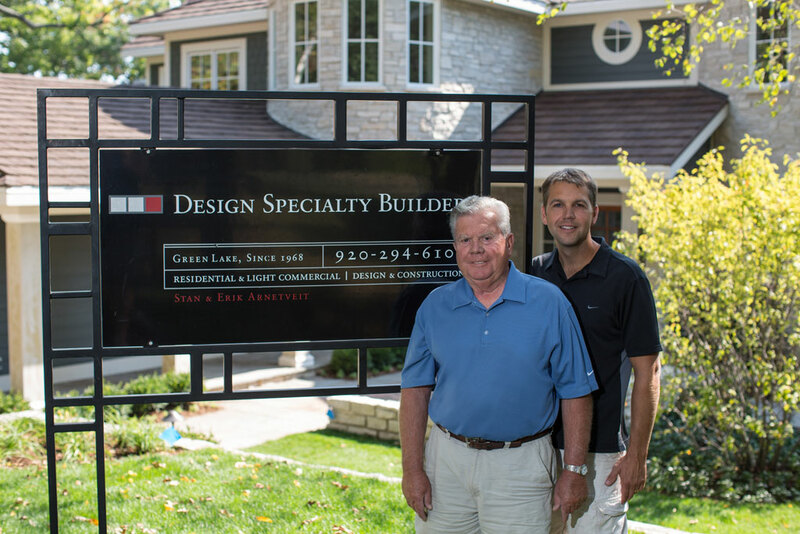 Our team at Design Specialty Builders holds years of experience mastering the art of carpentry and are trained to build according to the highest standards in home building. In fact, many of our carpenters have been with us for over 20 years—a testament to the team-focused approach of our business. Stan Arnetveit, founder of Design Specialty Builders, grew up building homes with his father, and in 1968, formed Design Specialty Builders. Stan quickly became known as the premier builder in the Green Lake area and lead the the construction of hundreds of quality homes and cottages. Stan remains involved in the business but in 2017 passed the reigns to his son, Erik. Erik Arnetveit learned the art of building high-quality homes at a young age as he spent summers on the job with his father, learning from the bottom up. Erik joined Design Specialty Builders full time in 1997 after earning a bachelor's degree in construction management and a minor in business from the University of Wisconsin-Stout and has since taken on ownership of the company. Erik works with Design Specialty Builder's clients from concept through completion–overseeing all aspects of each project and ensuring the highest standards of building are delivered to his clients.